Full of portents and promises, Wednesday was optimal for an installment of Library Lost and Found. Not just the first day of spring, the afternoon of March 20 was also the deadline for seniors doing honors theses; whoops and laughs could be heard throughout the busy first floor of Ladd Library as seniors did the thesis-binding thing. Paper for Anthropology 101, taught by Dana Professor of Anthropology Loring “Danny” Danforth, exploring whether ethnic clubs at the high school level perpetuate the false but persistent idea that race is a biological construction, or that it’s the same as ethnicity. Ray-Ban sunglasses in the classic Wayfarer style, popularized in the ’50s and ’60s by James Dean, Audrey Hepburn, Bob Dylan, and others. 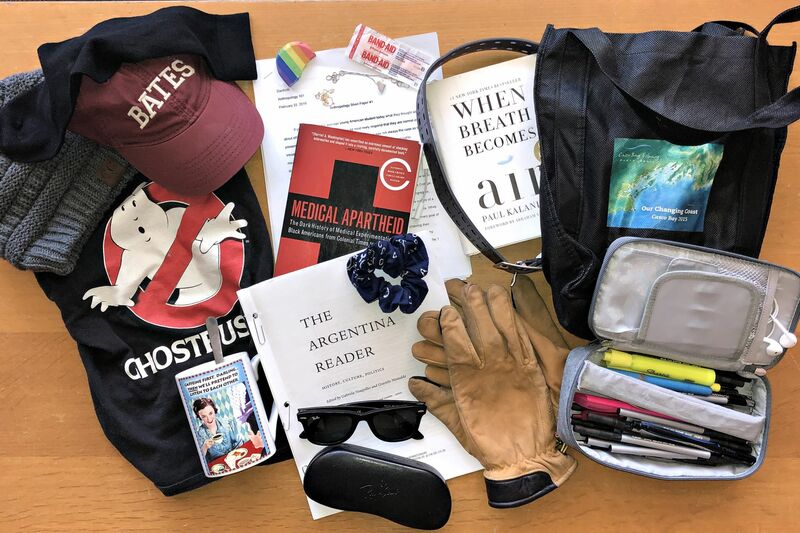 What’s in the Ladd Library lost & found on April 13, 2018?